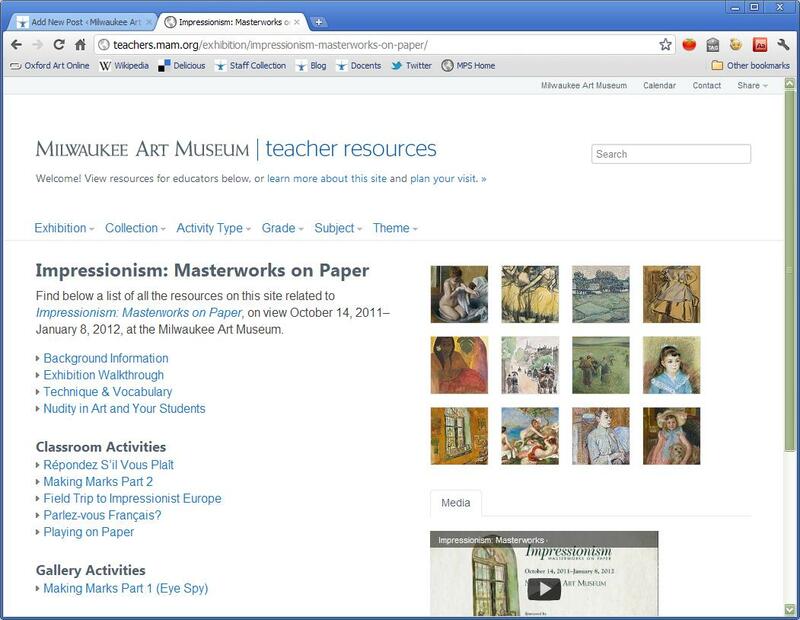 Screenshot of the new Teacher Resources site. Have you ever made a website? It’s not easy these days. Especially if you want it to be robust, web-standards-friendly, functional, and beautiful. Luckily, the Museum has a fabulous web team in our Communications department that assists with all the various whims and wishes of the rest of the staff. These two busy staff members–that’s right, there’s only two of them!–work hard every day to make our website look great and work well. 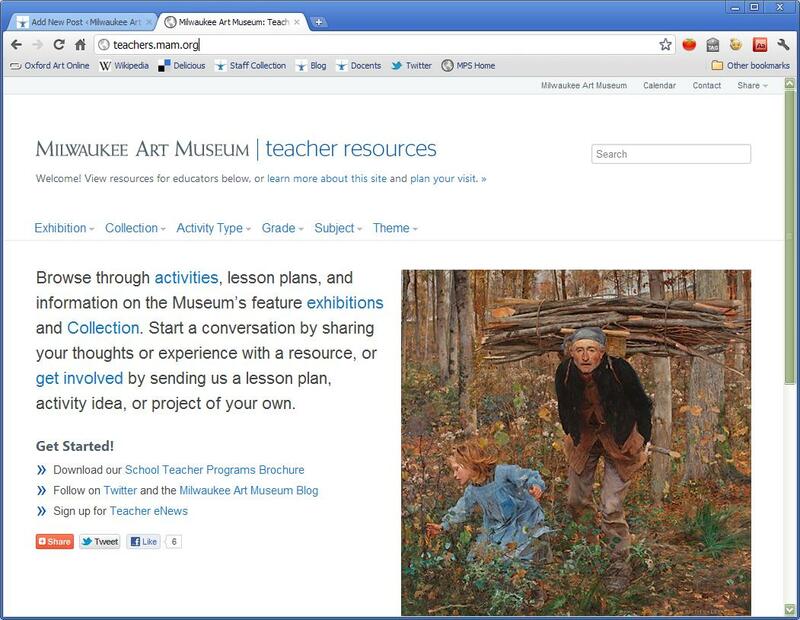 At the end of the 2010-11 school year, I approached the team with an idea for an online hub for teachers–full of resources, activities, lesson plans, and information on the Collection specially for educators, with comments and media embedded in every activity. I’m thrilled to announce that last week, we launched the new Teacher Website–click here to visit! I started by thinking about what would be most useful in a site for teachers. I knew some of the things that I wanted–a quick and elegant way to post resources on the “backend,” a clear and easy-to-use organization–but I also wanted to make sure the site was above all useful to teachers. So, like I do most days, I thought like a K-12 classroom teacher–exceptionally busy people who care immensely about the kids they teach. The site needed to be full of resources, but not intimidating. Activities had to be able to be referenced quickly in case a teacher was looking for a bell-ringer in the 5 minutes between classes. It needed to have comments so teachers could share their adaptations and feedback on activities. It needed to have lots of information on the Collection in a readable format. And above all… it needed to have big, glorious, easily accessible images of artworks from exhibitions and the Collection! This meant there were two steps to the process. 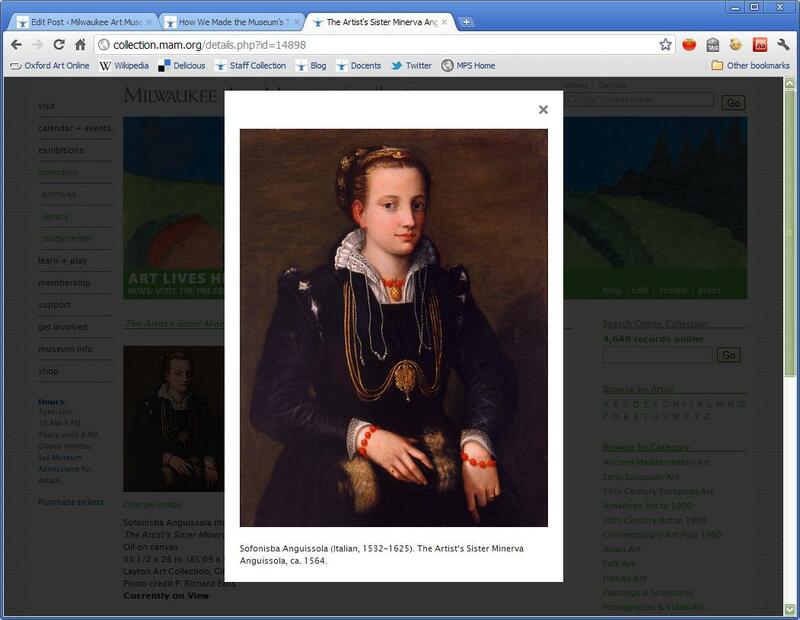 One was giving website visitors to the Collections website the capability to view the images in large-scale. Ever since I started at the Museum two and a half years ago, teachers have begged me for bigger images… and I was so happy to finally be able to tell them how easy it is to do! Just visit the Collections area, find your favorite artwork, and click on enlarge image. Easy as 1-2-3. A view of a large-scale image on the Collections site. Although the Teacher Resource site isn’t a blog, our web team used WordPress, a blogging platform, to build the “backend” of the site–where all the posts and content are written and posted. This meant that we had full and total control over how everything would be organized, but we also had a content management system that makes it much easier for me to update the site without having to bug the web team every single time. I’m especially proud of the powerful searching functions that the web team created for this site. Teachers can load up activities by a ton of different factors quickly and intuitively. Teaching third graders this period? Click. Want to get your kids involved in a brainstorming activity? Click. Need something to do on your self-guided tour? Click. Looking for something related to geography? Done. I’m also excited about the format of the activity itself. We got a lot of feedback from educators that our Teacher Guide PDFs (with background info, activities, and lesson plans on feature exhibitions) seemed too much like unit plans and thus too hard to quickly implement. So the activity pages begin with the type of activity, grade level, the exhibition to which it’s linked, subject area and “big idea” themes. 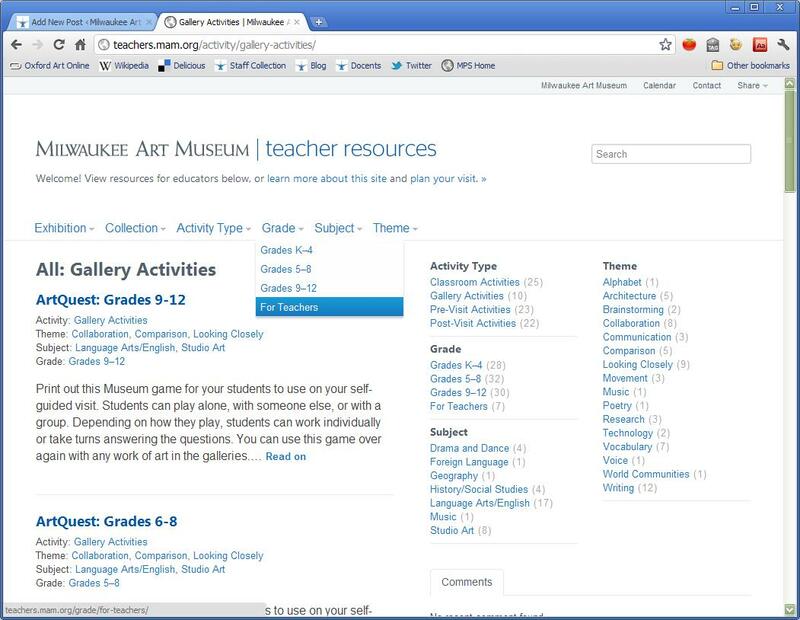 This gives a quick overview of how you can quickly integrate it into your day’s lessons. 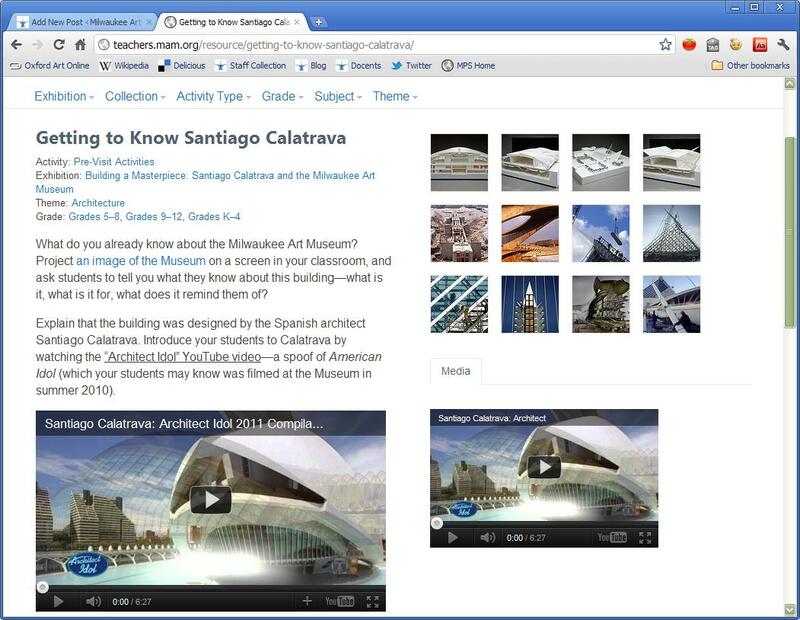 Many activities also have media, like videos and images, embedded in them. And of course they all are comment-enabled so educators can share their feedback on how the activities worked and if they’ve made any adaptations. Again, I’m so thrilled that the site is live! Please share your feedback, your resources, and any thoughts at all. A big thank you to Neil and Kris, our web team, for their hard work on this project! This entry was posted in Education and tagged teacher website, Teachers, Technology. Bookmark the permalink.